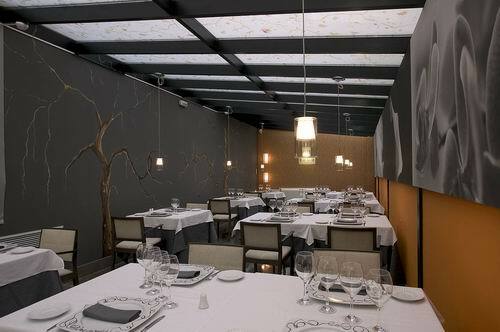 El Invernadero is a modern restaurant offering Mediterranean cuisine. The average price of a 3-course meal at the El Invernadero restaurant is 30 euros. Note that although GoMadrid.com strives to maintain all information about El Invernadero up to date, the prices mentioned are only an indication and may not reflect the exact value of your meal. Housed in a 19th century building with a wonderful, naturally lit terrace which has been turned into this class restaurant with carefully chosen decor. The extensive use of glass and use of modern paintings simulates its previous encarnation as a patio terrace. This restaurant is an obligatory stop when shopping in the exclusive Serrano area shops stocking designer-wear from Gucci, Loewe, Dior, Versace, Carolina Herrera, Cartier, etc. abound. The restaurant has a private room for groups of up to 12 people, and is ideal for meetings, or group dinners. Ideal restaurant for business executives working in the area wishing to try the specialities of this excellent restaurant. Mon - Fri: 13 – 15:30h & 20:30 – 23h. The nearest Metro station is Serrano. Please see the El Invernadero restaurant location map below.